For thousands of years, people have used tile as a solid building material. The collection of designs and advancements in technology over time have led to a great variety of style choices and potential applications for this durable flooring and wall option. 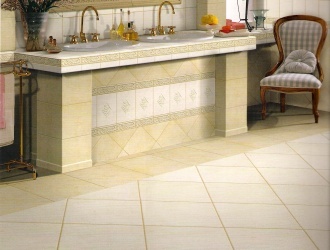 Ceramic tiles are made up of clay, quartz ferrous sand materials, and water. These materials are pressed and formed, then fired at high temperatures. A glaze or other type of coating is then often applied to form the finished product. Ceramic tile offers several advantages. Ceramic tile is very durable and comes in all sorts of sizes, shapes, colors, and textures. It is easy to clean (damp mop or sponge)and stain resistant. It is made with natural materials, and depending on the hardness rating, is very resistant to scratching. It repels water and is fire resistant (does not burn). Porcelain tile is very similar to ceramic tile. The only difference is that the clay used to make porcelain tile is finer and more purified. However, this difference makes porcelain tile much denser than standard ceramic tile, which gives it certain performance improvements. The higher density makes porcelain tile more durable and more resistant to moisture absorption (less than 0.5%). Because of this low moisture absorption, porcelain can be used for outdoor applications, where it remains stable in freezing conditions. The density also makes porcelain more resistant to staining, odors, bacteria, and allergens. Rich and beautiful, natural stone adds personality and presence to any room. And the different varieties: granite, travertine, marble, and slate, each do this in their own unique way. As one of the hardest and densest stones, granite matches its natural beauty with excellent durability. It is highly scratch and stain resistant, and can withstand the toughest wear conditions. It is hypoallergenic, resists bacteria and odors, and is simple to clean. 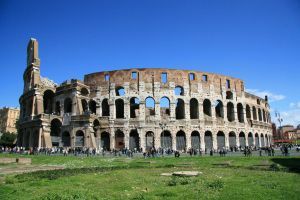 This was the primary building material used to construct the Roman Colosseum, and today it still makes a solid and versatile material. Travertine is a crystalized, partially metamorphosed, rock that belongs to the limestone family. It is actually a "younger" version of marble that has not been pressurized long enough to form into marble. This makes it harder and more durable than marble, and creates a totally different look. It forms naturally with small cavities and holes that make it porous, and these can either be filled for a smooth finish or left unfilled for a textured surface. There are four different finishes available: Polished, Honed, Brushed, and Tumbled. Polished travertine is the smoothest and shiniest of the finishes, made to reflect light. Honed travertine creates a matte finish, where tiles are polished just enough to create a smooth, flat surface. Brushed travertine and Tumbled travertine both create textured surfaces. Marble is also a crystalized limestone, but one that has been more fully metamorphosed. Its beautiful swirls and contrasting veining characteristics create an elegant and luxurious surface. Marble flooring is polished to a beautiful sheen and is fairly durable, but it does not hold up well in heavily trafficked areas because it is softer than other types of stone. This makes it less scratch resistant and susceptible to damage from acids and other chemicals like chlorine. However, when properly cared for and maintained, its beauty is unmatched. Slate is a metamorphic stone made up of clay, quartz, and shale, making it very dense. This gives slate a natural water resistance, and it can be used outdoors as well as indoors. The bold colors and texture of slate give it a rustic and natural look unlike any other type of flooring.